NCCAP is excited to announce a formal partnership with Brush Development Company to create NCCAP Certifications to meet the needs of persons living with dementia. With over 25 years of experience, founder Jennifer Brush is a Speech-Language Pathologist and internationally recognized Montessori for Dementia Expert. She is the only AMI Certified Montessori for Aging and Dementia Educator in the U.S. teaching the Montessori dementia care workshops. Montessori Dementia Engagement Certification curriculum provides a thorough introduction to using Montessori with elders and people living with dementia. It is open to all healthcare professionals who work in the field of aging - Activity Professionals, Nurses, Nursing Assistants, Home Care Aides, Rehabilitation Professionals, Social Workers and more. You do not have to be credentialed by NCCAP to apply. The educational content focuses on engaging individuals in person-centered activities that have meaning and purpose for an improved quality of life. 4,000 hours over 2 years engaging with people living with dementia. (Note: any current NCCAP Certification qualifies for this Activity Experience). 20 hours of CE on dementia-related topics from the NCCAP Body of Knowledge. Successful completion of the “From Can’t to Can Do! : Using the Montessori Approach” curriculum and exam. This course is offered online from Brush Development Company. The first year of Certification is included in the $199 fee for the online “From Can’t to Can Do! : Using the Montessori Approach” course, as long as all other Certification requirements are met by the individual. Application for the Certification is available through NCCAP. The first year of Certification is included in the price of the online course. Certification is good for 1 year and must be renewed annually for $30. 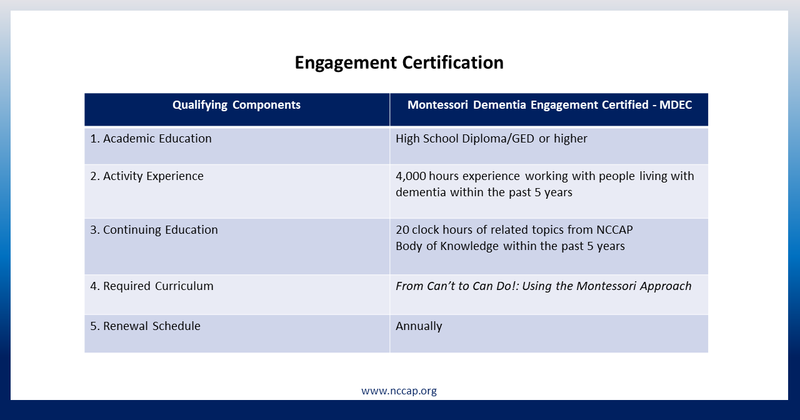 Certification Renewal requires 10 Continuing Education on dementia-related topics from the NCCAP Body of Knowledge.